These survey rings come in 2 sizes: 30 cm and 60 cm diameter. Made of heavy gauge stainless steel, they each have two handles making them easy to carry and set in place on the ground or in sediment. Use them for plant or soil surveys to mark off specific areas for sub-sampling by randomly placing the rings and only evaluating the plants or soil within the ring. They can also be used for stream embeddedness surveys. Stream embeddedness is the degree to which rocks, gravel, cobble or stones of the stream bottom are surrounded by fine particles (sediment). The degree of embeddedness can affect spawning habitat for fish such as trout and salmon. Fish also use these areas for shelter and egg incubation. The more embedded in the sediment a rock becomes, the less surface area is available to the macroinvertebrates which are an important food source for fish. Both fish and aquatic insects are more successful with low embeddedness; periphyton growth is also hampered by high embeddedness. 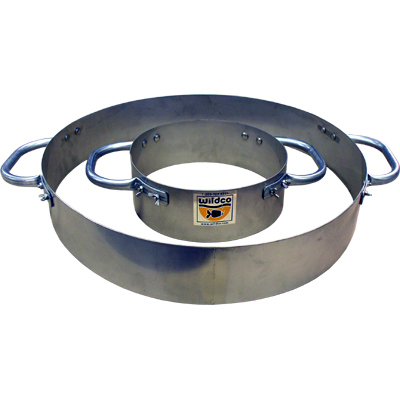 The sampler consists of a 30 cm or 60 cm diameter survey hoop (ring) made of heavy gauge stainless steel with handles. We include two clear rulers for measuring the cobble. To use, gently push the ring below the surface of the sediment and remove and measure each non-embedded rock. Next, measure each embedded piece with rulers and determine the depth of embeddedness.